How Much of This Asset Class is in Your Portfolio? It’s like going to the gym. You can’t expect to have the body of the Greek God, Adonis, without putting in the effort. You can’t outsource your personal workout. But you can work with the best trainers and the best nutritionists to help you achieve your goals. While these experts can help direct you, support you and encourage you, they can’t move your two feet, make you do a sit up or make you push the bar higher. Similarly, you have to decide what kind of investor you are. Are you a true speculator or just a passive investor that has a pipe dream about being a globetrotter and a fantasy life? Or do you see yourself as a fiery combatant, with a hunger to learn from every big success or big mistake. If you are true to yourself, your answer to the question could be, “You know what, I don’t think I want to sacrifice my family, friends, watching football on Sunday’s with the boys and taking the kids to swimming lessons to become the best.” For most people, this is not a sacrifice they’re willing to make. In that case, you need to find someone that’s willing to put in the long hours, grill the top executives and travel to the ends of the earth in search of the next big score. And the stage is set for big scores in resources. A few hundred grand today is the equivalent of $2 million back in the last resource bull market of 2010-11. That means that the capital in your brokerage or retirement account can buy a heck of a lot more value than it could back then when things were, quite frankly, insanely overpriced. Do not underestimate what tens of thousands or a hundred thousand dollars can do for you in the next 5-10 years. For some people, having cash ready will truly change their lives. And that’s why every speculative portfolio needs to have cash. I am very weary of the global markets right now. And I want to be positioned with considerable amounts of cash to take advantage of a major pullback, which I do expect. Again, I have no idea when the pullback will happen, but my gut is saying a big one is due. And I want to have cash available to take advantage of the fire sales that will take place. Over the last six months, we have continued to see signs that the global markets are jittery. Syrian bombs, Russian sanctions and Trump’s trade wars between all G8 countries are some of the many reasons to be cautious. Even in Canada, the federal government is fighting with provincial and municipal power-tripping bureaucrats. Safe havens such as physical gold tend to perform better in times of crisis; however, the equities don’t always follow the commodity. I believe this general market weakness and volatility will continue for the foreseeable future. This will have a negative impact on the share prices of many companies, including the best resource stocks. Consolidation, meaning the top-tier assets will get bought out by stronger companies. Lower prices for most publicly traded companies. A term you may have heard before – or seen me write about – is the Net Asset Value of a company. Net Asset Value represents the true value of the company. It is not influenced by share price fluctuation, management teams, or paid promotion. Net Asset Value represents the intrinsic value of the business. It is based on the amount of cash the business is currently generating, the cash the company can generate in the future given its assets, plus the difference between total cash and total debt. It’s the purest form of company valuation and a building blocks for all my investments. I build my largest positions when companies are trading at a heavy discount to Net Asset Value. Alterra Power is a perfect example of buying a company which was trading at a 50% discount to its Net Asset Value. Yet it took several years before a suitor acquired the company, paying 97% of Alterra’s Net Asset Value. I wasn’t popular when I stood on a panel with Ross Beaty and Rick Rule and said that their geothermal companies were overvalued in 2009. But I pounced on shares of Alterra when the shares declined to the point where they were a screaming buy starting in 2014. I kept buying on major dips all the way to mid-2017. My thesis of picking up shares in a stalwart company paid off and concluded with a buyout. I believe this market weakness and volatility will create several significant opportunities for us to buy resource stocks at terrific discounts. It’s already allowed me and my subscribers to build positions in world-class companies that are trading significantly below their Net Asset Value. Nobody wants to waste their time reading an investment/speculative research letter unless it provides actionable opportunities to make money. So, why am I so focused on raising cash for my portfolio? I think that we will have an amazing opportunity to pick up incredible value in late 2018 and into 2019. 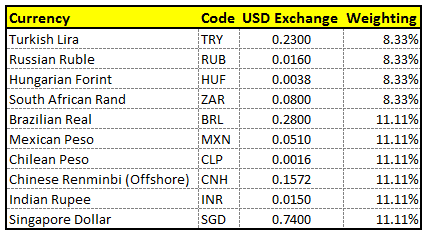 The chart below is a very powerful chart that shows the current struggle of the Emerging Market Currency Index. 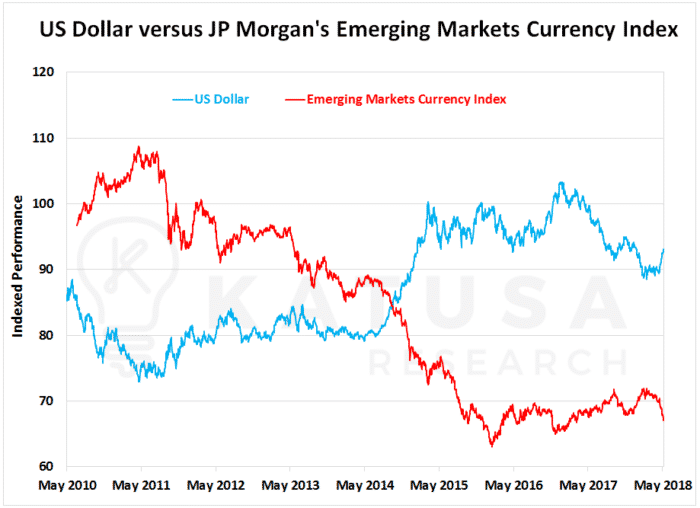 This is only one indicator, but when I overlay the USD effect, I believe the USD is in the early stages of a breakout when compared to the EM index of currencies. The JP Morgan Emerging Markets index is not perfect, as it’s a composition of 10 nations (listed in the below table with their corresponding weightings). China should get a much bigger weighting, because frankly, where China goes, the emerging markets go. I have written a lot about the PetroDollar, and it was a key feature of my New York Times bestseller, “The Colder War.” Something that I want people to understand is that the success of the shale revolution will have profound geopolitical and investment effects. 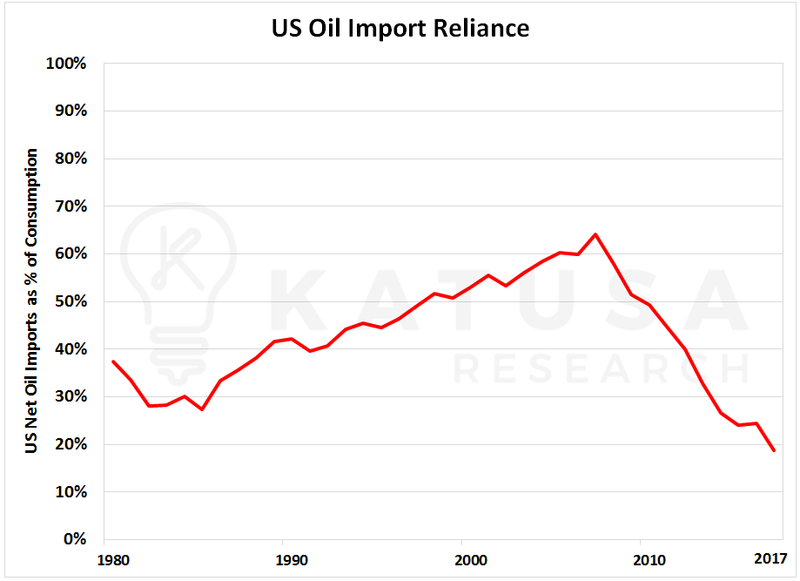 During my lifetime, the U.S. has never imported as little oil as they currently are. The chart below shows that for the first time in 40 years, the U.S. is importing less than 20% of the crude oil they consume. This has powerful effects globally. It means there are less PetroDollars globally now than at any other point in time in the past few decades on a percentage basis (remember, you need to net out the price difference in oil prices). This means that the Emerging Markets (which have benefited from PetroDollar investments from oil-rich nations) will be finding themselves at a shortage to pay back the loans they have taken on in U.S. dollars. Because of this, there will be a shortage of U.S. dollars in the emerging markets. In turn, this will lead to an economic expansion slowdown in the emerging markets, which will cool down the metal prices of most commodities in late 2018 to early 2019. 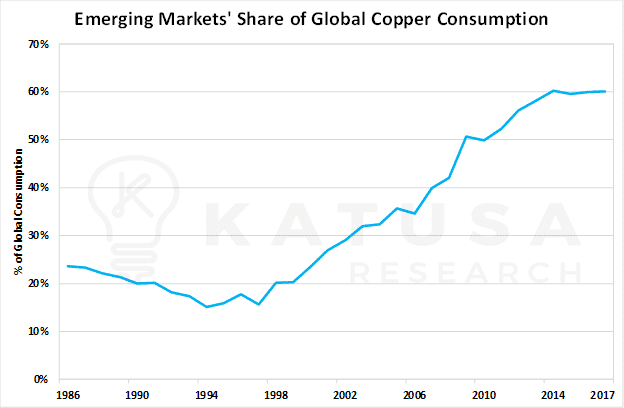 For example, even though I am very bullish on the medium to long-term price of copper, the emerging market share of copper consumption is over 60% at present, as shown in the chart below. 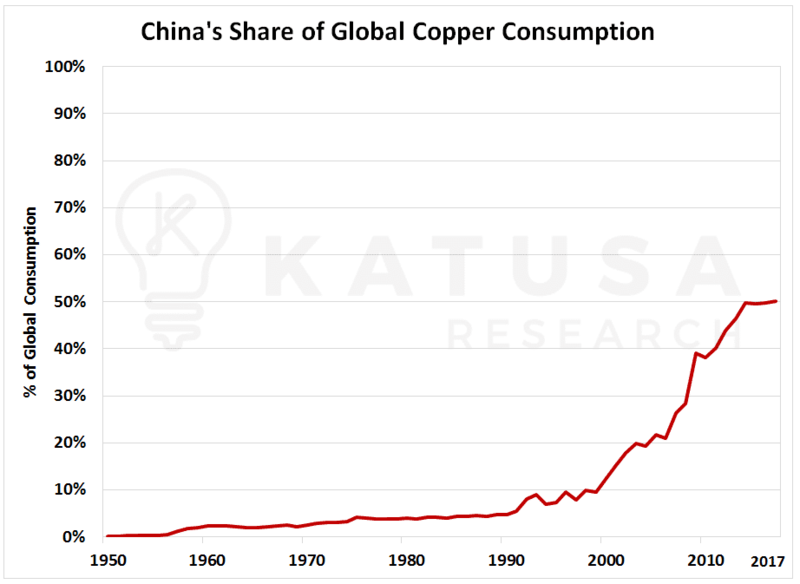 Of that 60%, China makes up a little over 80%, because China still makes up half of the global copper consumption as seen in the below chart. If China has a slowdown, copper is clearly a resource that will experience some price pressure in the short term. And how is China doing? The answer is not great. 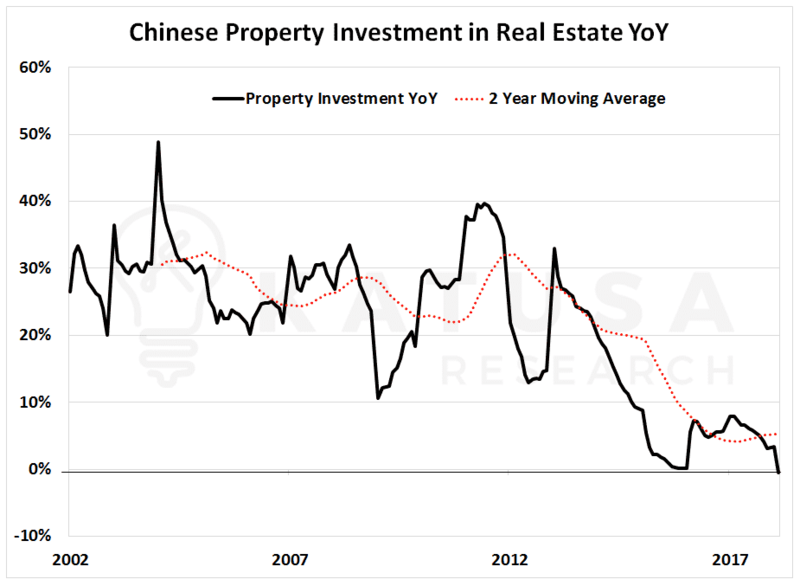 This past quarter, housing in China has slowed down a lot and has crossed into negative territory for the first time in 20 years. The chart below is the property investment YOY (year-over-year) percent change and the two-year moving average. Serious carnage will hit if the two-year moving average goes negative; and right now, I think it will. This is something we are tracking closely. If we zoom in a little and examine the month-over-month change, we see a breakdown that confirms the trend in the YOY change, as seen below. 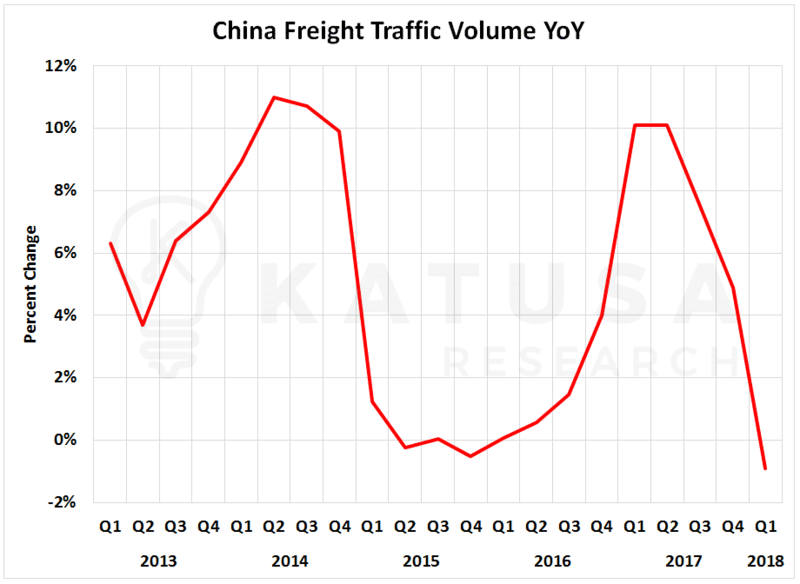 A chart that you’ll see in a moment and one that should spook all resource longs is the year over year (YOY) numbers of China Freight Volume. The last time the index was this low, almost all commodities dropped significantly, and with the resource stocks. 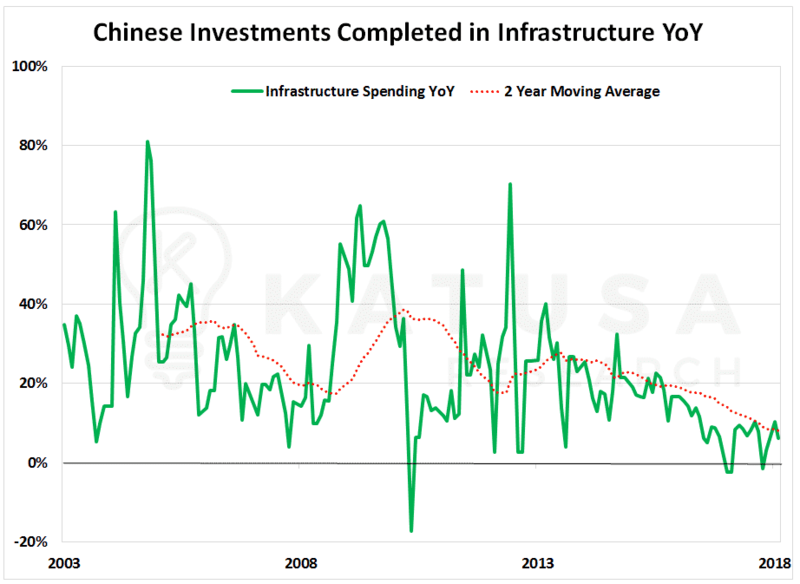 I would expect the government of China to pick up infrastructure spending if the construction industry is slowing down. But the data below is showing that infrastructure spending is slowing down year over year as well. Not to mention, the two-year moving average is trending lower and lower, as can be seen in the chart below. 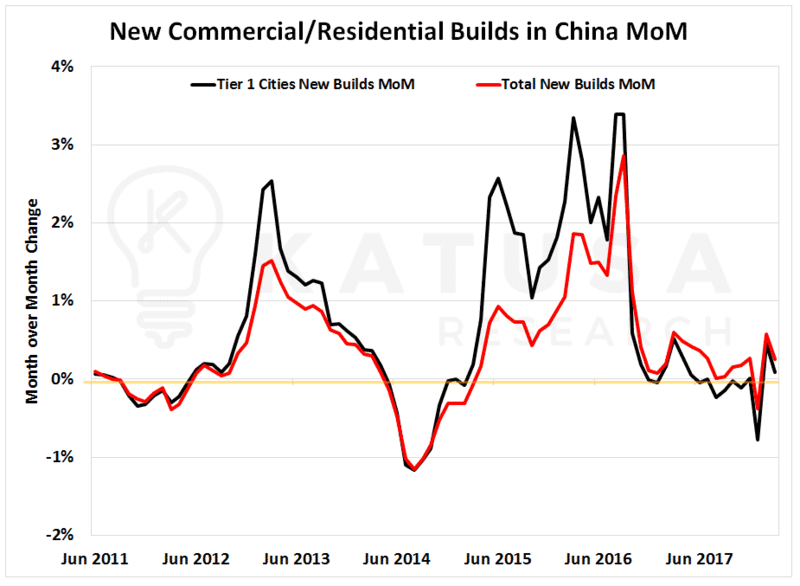 Historically, I have noticed that Chinese government infrastructure generally picks up when freight traffic slows down, but this is the first time in 20 years that we are not seeing this relation. Both Chinese freight (exports) shown in the chart below, and their domestic markets are cooling down. The Chinese Fortune Cookie says…. The U.S. and China economies matter more today than at any time in the past. I believe the rest of the Emerging Market nations are not in a position to pick up any slack if the Chinese economy takes a dive. A strong U.S. dollar will only compound the pressure on the Emerging Markets and put more strain on the Chinese economy. I am more convinced than ever that we must tread very carefully in all our speculative and investment decisions. In hot bull markets, there is room in the portfolio for “high fliers” or “punts”. I do not think this is the right time for those types of speculations. Now is the time to be protective, and only own the best assets operated by the best management teams. Unless a company is a core position, one I want to become a core position with compelling valuations and near-term catalysts or it is a takeout candidate – I will not have exposure to the position in the Katusa’s Resource Opportunities portfolio. I take knocks to the chin, but I keep my home run mindset intact. Cut your losers and let your winners win. P.S. Today I’m well cashed up from some great recent core position wins like Alterra Power, Kirkland Lake, and Nevsun Resources. And I’m very excited about two companies that I’m betting very big on. My investment thesis is that this will be two junior stocks that are excellent takeout candidates. You can read all about them in my special research report, “Blockbuster Buyouts: 300% Gains from the Best Gold and Oil Juniors of 2018”. To learn how to gain access – click here.